"It was the quickest delivery I have known and the packaging excellent"
"Perfect fitted in trellis in the garden ." "Good product. It reflects light into the dark corner of the garden which we wanted it to. It’s lightweight, so easy to carry around. This is good as we have to keep moving it as the Earth continues to orbit the sun! We did put batons on it to give it some rigidity." "Good product but I will need probably to cut it." "Standard of reflection looks very high, as stated the delivery was very prompt and the parcel wrapped well to protect purchase." "Mirrors both had broken corners." "Exactly what it says on the tin and now installed behind trellis and works a treat in creating spatial illusion in the garden." 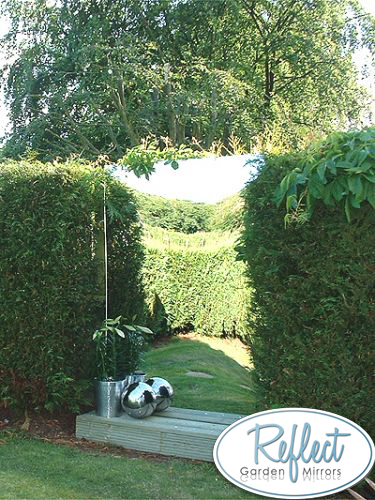 "These garden mirrors make all the different's in a small area and the plants have really come on with the reflective light"
"Lovely and easy to fit. Looks amazing."